We get our cues from the best. Places like The Cleveland Clinic, Johns Hopkins and The Mayo Clinic. These fine institutions offer a different level of care that we look to emulate. While we look at all aspects of your mouth and how it relates to your overall health, no 2 examinations are exactly alike because no 2 people are exactly alike. YOU are unique and we care for you in a way that respects your individuality. Our unique approach begins with attention to details and our computerized health assessment. You might take it through this website or you will be given it on a tablet when you come to our office. We want to know as much about you as possible so we can help establish a baseline and connect the dots of how your oral health land overall health intersect. Caring: Above all else, we’re here because we care. Listening: We will listen to your story and your history. Looking: There’s still no substitute for human eyes, though we use enhanced technology too. Touching: Again, there’s still no substitute for the human touch. And, we will feel your muscles and your glands to assess how healthy they are. Technology: We use the latest technology to help uncover causes. Time: This level of care takes time, to collect the data and perhaps more important, to evaluate it and put all the pieces of the puzzle together. BREATHING; is our PRIME DIRECTIVE. Without air, we won’t last 10 minutes. So, because your mouth is an active part in the proves, we evaluate it’s role in the process and see how we can optimize your ability to breathe well and sleep well. 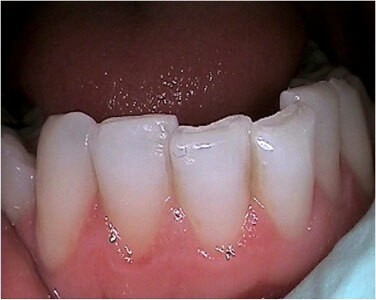 Inflammation; is most commonly found in the mouth in the form of gum disease. It’s a major factor in overall health and wellness, so preventing inflammation will be a major focus of our effort. We will analyze your inflammatory risk by using the latest technology including salivary diagnostics to see your personal bacteria profile. Decay: remains a constant risk that changes over our lives. It is affected by what we eat and the quantity and quality of our saliva. So, we use special salivary diagnostics to measure these factors. This way, we can constantly monitor your risk and provide preventive strategies to cope with this ever-changing risk. Camera: we take lots of photos with high-powered, digital cameras that show things that might not otherwise be seen. It often allows us to see things even before they become apparent on X-ray. We find that our digital oral camera allows us to reduce the number of x-rays we have to take, lowering your overall dose. 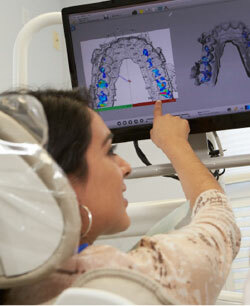 Computerized, digital scanning devices: We use the latest technology to see under the surface of your gums, jaws and fillings so we can discover potential issues before they become problems. Jaw-Motion Analysis: How your jaws, your joint (TMJ) and muscles interact is critical to breathing, eating and speaking. We use computer technology here to determine each of these components’ health.